The second meeting of the Norfolk Angling Club took place tonight again at Weybourne due to the recent closure of other venues, 19 anglers including two new members turned out for perfect conditions on a mild evening with beautiful clear skies. After recent matches the dreaded pin whiting would no doubt be pestering us all again and fishing to size limits it would be a struggle to find any sizable dabs. Undeterred and with plenty of banter before the match the scene was set and as the horn went off everyone was keen to get started. Fears were soon realised and the piranha like whiting stripped bait with the such expertise as sometimes not even getting hooked or even their lipstick smudged, frustration was the order of the night. As the match progressed several members started to record a few sizeable fish, cursing and panic had set in with some members not being able to face blanking or coming last again but eventually all bar 3 managed a fish to save the blank. Top rod of the night was Andrew Turk who takes his first podium spot with 7 fish for 2lb 5oz all of which were dabs the majority being 24cm long but his best was 28cm and a 27cm which both helped his cause. 2nd place went to the ever improving Richard Chapman who had 8 fish for 2lb 4 1/3oz 4 rockling and 4 dabs were his tally the biggest of both being 26cm.3rd place went to Trevor Barnes with 6 fish for 1lb 13oz 5 dabs and a rockling with his biggest dab also at 27cm. 50 sizeable fish were caught and returned alive with the majority being dabs and a smattering of rockling one solitary sizeable whiting was also caught by Henry Randell which shows how poor things currently are. Well done to our two new members Wayne Brown and Campbell McKenzie both managing to card 2 fish each. Two of our ladies fished tonight and it was a close run thing between Ally Barnes and Kimberley lawn, one fish separated them with Kimberley taking top spot with 3 fish for 15oz and Ally 2 fish for 10oz, giving Kimberley her best placing yet with a 5th overall well done to both. Next week’s match is at the Old High which should be interesting and the possibility of a codling or more probably a bag full of rockling. There is a meeting this Friday night at 7pm in the Village Inn at West Runton, please try and come along as everyone’s voice matters in the running of the club. 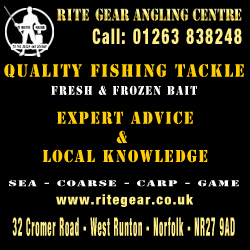 Anyone who has considered joining an angling club now is the time to come along and start 2014 with a great bunch of people fishing and socializing and learning new tactics and techniques all are welcome and we would love to see you there.